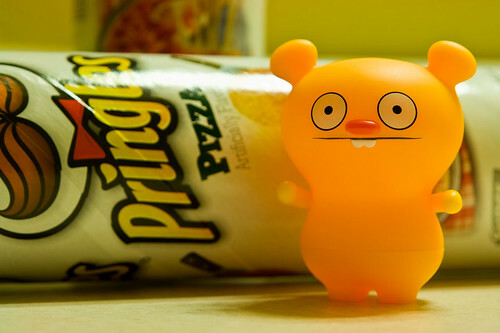 Uglyworld #823 - Pizza Pringles (279-365), originally uploaded by www.bazpics.com. Trunko couldn't believe his luck when he found some Pringles at the local supermarket in Pizza flavour. He's never seen them before and is a little confused as to "hows the hells can they fits a whole pizzas onto each Pringles?". Thankfully "popping" them open soon stopped him thinking about how this was possible, as he was too busy munching through the whole tube!